Leanness in Domestic Birds: Genetic, Metabolic, and Hormonal Aspects is a proceeding of a symposium held in Tours, France, from 4 to 6 August 1987. Said symposium was concerned with genetic and metabolic factors associated with leanness of poultry and accounts of research in these areas. The book is divided into six parts. Part I covers studies that involve genetics in the selection of meat leanness. Part II deals with the relationship of feed intake and metabolism to the leanness of poultry. Part III discusses the lipid metabolism in birds and its related factors and effects. Part IV talks about the use of hormones such as insulin, thyroid hormones, and corticosteroids in the control of fatness in birds. Part V covers studies involving amino acid metabolism and its relation to leanness in poultry, and Part VI talks about the applications of the studies in commercial use. 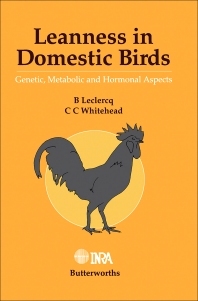 The text is recommended for zoologists, agriculturists, and poultry farmers who would like to know more about the different factors that affect the leanness of domestic birds and its implications.